CDW•G gathered a group of Texas leaders at TCEA to talk about the hurdles of technology in the classroom. Jenny is the senior editor of EdTech: Focus on K–12 magazine and comes to EdTech by way of an educational publishing company. In February, CDW•G sat down with six K–12 IT professionals and educators from four Texas school districts to discuss the role technology plays in teaching. 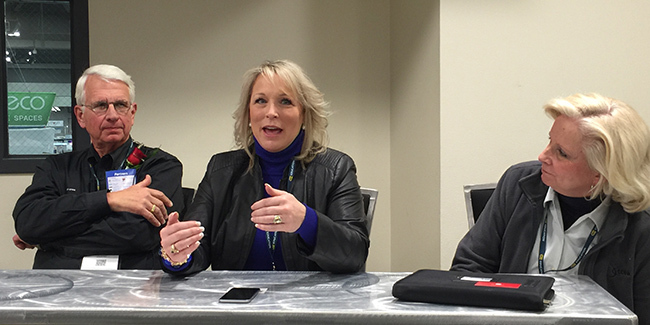 The roundtable discussion, held during the TCEA 2016 conference on educational technology, in Austin, Texas, was moderated by Chad Stevens, chief education strategist for CDW•G. Stevens: Let’s talk about the shift we’re seeing in teaching and learning, as well as the role IT plays. Russell: In technology, when I began, you were the one with the screwdriver in your back pocket; now you’re more the integration person who’s trying to encourage and entice people to use the tool in the learning process. It’s gone from the box to a consultative role in the classroom. Goode: I think we’ve decided that we can’t be separate departments and you have to work together. Where technology comes in, we come together to provide professional development as a team — our motto is “provide and guide.” We provide those resources and guide the teachers in using them, whether it’s through modeling the new technology or support and encouragement. Hughes: It’s been a shift for our instructional coaches. You have to help them come along and understand, because they may be leading the technology piece of it, but they’re not comfortable with the educational aspect. My favorite thing to say is, “What are you going to do with it?” People want to chase the bright, shiny object, but if you don’t know what to do and it doesn’t enhance learning, then what’s it for? Stevens: In the new educational plan for the U.S., one of the terms is this notion of the “digital divide.” What does it mean to you? How are you addressing it? Hughes: We did a one-to-one rollout of Chromebooks at our high school. My take was that the kids were going to be excited to have the devices, but we had a very small number of students who reacted very strongly to not wanting a device; those were typically the ones who weren’t very successful in school, and a lot of our students hadn’t touched a computer. They need to trust that you’re there to help them succeed, and that goes way beyond handing them a device. We had one student pick up the device and say, “Now I think I can go to college.” Technology can evoke strong emotions because it’s just that powerful. Brooks: Students need to see the value of using a tool. If they don’t see learning out of it, they’re not going to make any connection whatsoever. Stevens: What are you doing in schools to address access and digital equity? Russell: I just bought some tablets with a data plan. I’m rolling those out for students who don’t have Internet access at home, and it’s pretty inexpensive. Jones: We educate teachers on the importance of using Google Drive. We want to make sure the resources that they need are on the laptop before they leave. We need to help teachers understand and be cognizant that when they assign something, they’re being considerate if students have Internet access at home. Hughes: We purchased 12 Cradlepoint routers with mobile Wi-Fi and put them out in high-density, low-income apartment areas. If you have the MAC address of the kid’s device, they can connect from home to that router. You can connect up to 30 devices to this Cradlepoint router for less than $40 a month. Stevens: What advice would you give to other schools? Hughes: The level of buy-in from your superintendent is critical to the success of any large initiative. If they don’t buy into it, you’re not going to get there. Russell: I’d have to say, build a great infrastructure and go Google. Sleeper: From the administrative side, I would caution you to look at sustainability before you implement. Before we went one-to-one, I told the board, “Unless you can commit the money, don’t do this.” You’ve got to understand what it’s going to cost you in 10 years before you take the first step. Brooks: On the instructional technology side of it, preparation for your teachers is key, as well as lots of support. Celebrate the small successes they have in the classroom. Goode: While it’s important to have your superintendent support your initiative, it’s important to get buy-in from those implementing it; they’re the ones in the trenches. You have to provide ongoing professional development, make it relevant to them and find unique ways to keep them trained. Jones: The No. 1 thing is that it’s not about the device or technology. If you’re focused on the tech, it’s not going to happen. It’s about the learning; technology is just the tool that we have in our toolbox.